Some investors are fearing that the recent action in the stock and bond markets is signaling a recession may be nearing. If that's the case, there could be an unlikely market to hide out in this time: housing. It was the center of the last crisis, but before that housing prices tended to hold up and even rise modestly during an economic downturn as mortgage rates fell in tandem with interest rates. If history is any guide, the housing market could be the unlikely safe haven in the next recession once again. "Other than during the GFC (Great Financial Crisis), home prices have kept rising even during recessions, probably because rates fall, the vast majority of people retained jobs and household formation continues," said Thomas J. Thornton, Jefferies' head of U.S. equity product management, in the note to clients Saturday. "This could be a particularly big cycle for household formation owing to the millennials," he added. Rates started 2018 on the rise and seemed to be on course to march steadily higher until the recent sell-off in stocks. 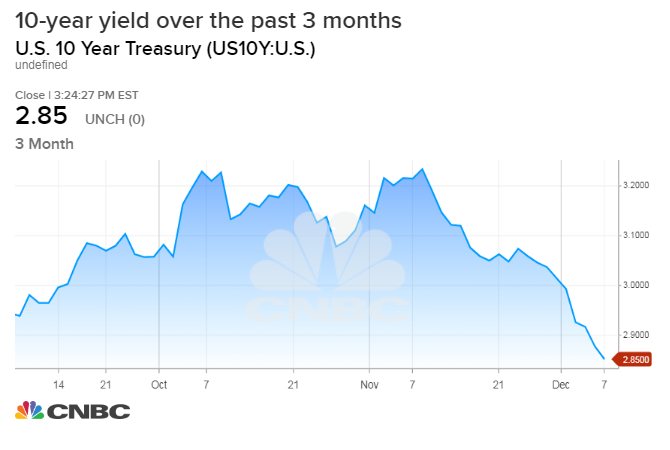 The yield on the 10-year Treasury note has fallen from its 2018 high of 3.25 percent reached on Oct. 9 to around 2.87 percent on Tuesday. With the stock market selling off on recession fears, investors have plowed money into Treasurys which is boosting their price and lowering yields. That, in turn, is helping lower mortgage rates, which just hit a two-month low. And although the Federal Reserve has hiked rates eight times in three years, the benchmark rate is still well below the 4 percent level seen at the beginning of 2008, near the start of the crisis. Plus, Fed officials have expressed caution on the pace of future rate increases. Unlike 2008, the housing market is not being driven by homeowners who are the highly leveraged. In fact, the household debt to total income ratio is at the lowest in 15 years, said Ken Leon, director of equity research at CFRA. "Because there's a scarcity in inventory in housing market, it should keep prices stable and maybe modestly growing higher," Leon said. To be sure, home sales are slowing, with pending home sales in October dropping 2.6 percent. But with mortgage rates coming back in, there are signs of stabilization. As for the homebuilding stocks, they can be a volatile group because of their small size, but have lately shown signs of bottoming and are even outperforming the market. 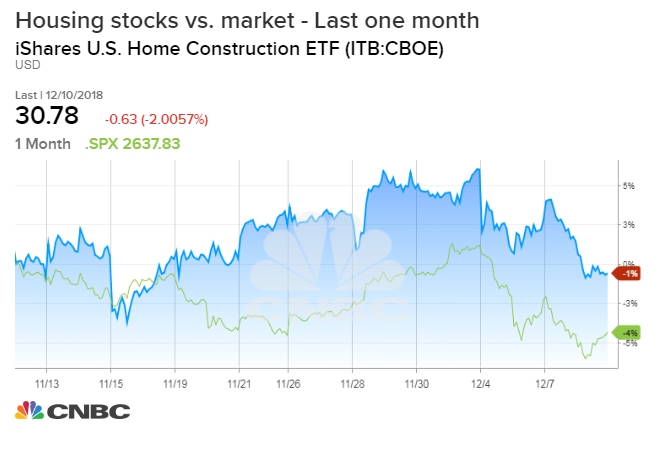 The iShares U.S. Home Construction ETF (ITB), which counts D.R. Horton, Lennar and NVR among its top holdings, is off by 30 percent this year as the shares got hit during the first three quarters of 2018 on the rise in mortgage rates. But in the last month, the ETF is only down 1 percent while the market has gotten hit by 5 percent. "Strength in homebuilders probably isn't just a fluke," Jefferies' Thornton said. The sector's resilience is coming from a healthy consumer base, which is expected to spend more on remodeling and renovation, Leon added. "There are over 126 million U.S. households that are ripe for home improvement. The consumers are enjoying job growth and higher income, they are going to spend money on the existing houses," he said.